There are no pictures from Anaa in Rutena's journal. 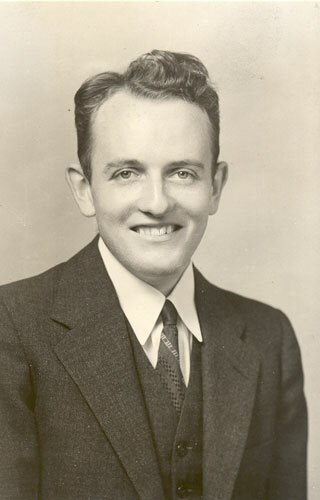 Doyle Green (Totare), assistant managing editor of The Improvement Era, requested them for possible inclusion in an article to appear in 1949. Doyle probably returned them, however they were subsequently lost. At the time of writing the past few days diary, we find ourselves in Anaa, with a home given to us as long as we are here. We landed early this morning and I hunted up Gauta. He welcomed us in and though he has just a little home, a cook-shack, and a storage shack, he moved out of the house, put a bed up on its stand, had a couple of girls and fellows sweep everything clean, borrow a table for us, get our boxes up here; and breakfast for us. As it is and regardless of what we say, we have the home, they moved into the storage shack, and everybody is happy. All except the Catholics and the Priest. He spoke once but the second time I attempted conversation, he hurried on. Now it is evening and in a few lines here I report my true feeling of thanks to our kind Father in Heaven for his many mercies upon us. Here we are, just two kids out in the Tuamotus among very strange people. Once again our few little worries and touch of loneliness has been swallowed up in the overwhelming largeness of these peoples hearts and the way our way has been pointed out for us. I feel very humble in this position I hold with Elder Price at my side. Tonight we are to have a few visitors here to hear Elder Price play his violin. Our Priest, I'm afraid won't come; he was quite busy warning his people all day. Last night the people considered how we must feel after that ship ride, so they let us retire, postponing their visit. Today has been swell. All morning we had visitors, just curious to see what we looked like, talking a little but mostly just sitting. Then after dinner we had our Tahitian reading class... Elder Price's tongue is loosening up. Before Sun-down the younger fellows wanted a game of ball. We had brought a soft-ball, which I bought from Elder Peterson for 5 F. Already it has proved it's worth. These fellows picked up the game right off, and liked it. I did the catching and coaching for both sides. After the game we visited the Gov. on special business. Tonight we had nearly forty people, young and old, in and around the house. Elder P. played his fiddle, I did most of the singing, two other fellows played guitars, and the older folks sang Church (Sanito ) hymns. I believe we really made friends by that little cottage mtg. Retired around 10:00 P.M.
We used the morning in our usual period of study and gossip. Then in the afternoon Teiho, Elder Price and I took a walk over to where the old city used to be to see the remains since the tidal waves of "03" and "06". We saw the remains of the foundation of the Mormon, Sanito , and Catholic churches, the tura pape ruins which once were 7 ft. in the ground and are now level with it, a wine cellar, and the graveyard. One cement tomb was loose and inside could be seen bones of a human. Superstisious natives would never think of touching them; personally I'd like one for a souvenir. We got signed in by the Governor today. Spent a while visiting with Hiringa tonight. The kids surely like baseball. We sat in the house all day except for our usual morning walk into the aihere. I wrote a letter to Ioane ma , listened to Elder Price read Tahitian for an hour, read a few articles, finished reading Life of Jesus which I started a couple of days ago. A few fellows came for a while but when they saw no meeting was being held, they left. I invited them back for a cottage meeting at night. In the evening I led a little discussion from the book of the setting up of the Church and it's progress. Gave an introductory speech of why we are here, etc. The meeting lasted an hour, had about 26 people in the little room here and I don't know how many outside. For two hours after that we had singing, etc. Noromana played his fiddle... very good, too... for which the people were pleased. At 9:00 P.M. we told them the hour sleep had arrived so they graciously took the hint. A good evening. These days are certainly full ones. This morning we worked over a time schedual which we hope to be able to keep. Then came a study period, next came time to take a picture we promised Hiringa we would take. We went to his home a little distance from the house here. Quite a number of people heard about it, and they surely flocked in to watch. They acted as though they had never before seen a kodak work. This evening we had about nine adults and two children in. Our topics were about everything in general. Then we really got into some good discussions of Gospel; liquor, tobacco, Book of Mormon, and at the close I gave our "smart" Protestant a Buka Haapiiraa Hauti no te Tamarii . When he made that crack I surely had to keep from speaking some pretty hard words to him, but in the end he was squelched and wanted to borrow the book and read it. Today we followed pretty close to our schedual. Before breakfast we had a little studying, then breakfast, then our first walk out into a tracting tour. In our tracting we visited six homes, gained the front porch on two, inside on three and the front steps on the other. We got in some very nice discussions... I mean I did. They just sat and listened and took in all I said, believed a little of it and probably resolved to be better in their own denomination. Oh well! Our garments are free. I certainly put a sincere heart into my talking but a native is a native and obstinate but lovable and friendly. Gee, I surely think the world of them. If they would only let us help them! Tonight there are quite a number here to listen to Elder Price on his fiddle. (Gee, it squeaks.) (Never did like a violin.) We seem to be able to expect them every night. They just sit though and don't talk. It takes two to make a conversation and I surely have a hard time holding my own end let alone both of them. I'm relieved that Elder price is playing for them. He surely is a queer fellow. I really have never met anyone quite like him. I thought I was (and am) awfully dumb but really when it comes i te reo Tahiti... Ai! Aita e hoe taata mai ia'na te huru. Ua haapii noa vau ia'na i te hoe parau nainai... aue! Ia'a e! Aue te rave ata e! E mea fifi roa ia'na ia roaa mai i te ite. Ta'na maa... ua tua oia i te faraoa i te aua, i muriho te pape veavea. I reira ua tuuhia te inai e te tihota e te u. Wotta meal! Tracting again this morning and only for an hour. The first house was a staunch Catholic. The girl (or woman) laughed and smoked her cigarette in my face until I got tired, in a polite way "told her off" (as a missionary should) and left the place. My garments are clean of that place too. The other four places were like icebergs and we didn't get to first base. Of all the silly people! Grown women began to run when we approached a certain house. How foolish! I'm surely disgusted and fed up but I'm not through trying yet. Tekehu, Teiho, Hiringa and Gauta are a great comfort. They're swell! Elder Price... he's... I don't know... a help, draw-back, or just a kid. If someone wouldn't think I was backbiting, I would write how dumb I think he is but I dare not. I believe he has Pres. Hardy's pet Elder story beat. Wow! We took a nice long two hour walk today, and surely saw some beautiful scenery again. A place where the lagoon runs back into the land in a river form. The color was deep blue and green and that coupled with the sunset made a very pretty sight. Upon our arrival at the house we ate our usual fish and drank a pape haari and then went in the kitchen to talk with Gauta. Instead of the people finding us home tonight, we fooled them and let them find us in his place. Teiho made our visit worthwhile... we spent most of the time in a study of Tahitian. Just as I was getting up I heard Marama say there was a ship at tua . Soon after, Elder Price woke up. We dressed, wrapped our package of letters in two sheets of type paper, and then went down. We learned from the Capt. That Elder Asay was on board. When the boat went back out we asked a sailor to tell him to come ashore. He did, and I surely enjoyed the ten minutes we were together. He's surely one fellow I like and think a lot of... so much like Owen. We rushed up to see our quarters, talking all the way, and after drinking a pape haari we hurried back. It was a short visit but a big help to a homesick guy like me. (Oh yeah!) Anyway, I was glad to see him. He had the swell news that Mahinui had repented. Swell! Today we went fishing. And a real day it was. Teiho did all the spearing, and getting some big ones too. Elder Price and I swam around watching and getting sunburned. We stopped way over on another piece of Island, bathed and looked around. Didn't accomplish much but learned quite a bit. Tonight we are retiring early... about 7:30. Nobody has come to see us so... Goodnight. Elder Price, as he was preparing for bed, found out for the first time he was sunburned... Oh! He's an odd case! Another day mostly of study. I read Haggai, Jonah, Zephaniah, and a few other short books of the Bible. Our regular reading class of Tahitian every morning is surely picking Elder P. up in pronunciation. I gave a thirty minute lesson today on man's free agency. In the after Elder P., Teiho and I exercised by jumping. At night we walked to the wharf, or tua , and sat talking. Soon a Re-organite came by we hadn't met. He and I talked, it rained, we climbed the lighthouse and sat under the eaves until it stopped. Returned to the house and Elder P. entertained a bunch of young folks while I lay on the bed. I dropped to sleep and upon awakening, I shoo'd them out and we went to bed. That guy is going to be the death of me yet. Before we ever had time to clean up this morning we had visitors. They just kept coming and going until time for dinner. One fellow, Raure, and I talked baptism of infants. He wouldn't reason or give an inch; just wanted to argue. I ended it by reading Moroni 8:14 and let it go at that. After dinner Teiho, Elder P. and I walked i tua for exercise. Upon returning we went to T. house and spent a very pleasant hour... even were served lime-ade. At night I held another cottage meeting. The yard was full of people and there were 29 in the house. We continued our tour of last week, following the trails of the Church. After meeting we had our usual song and violin practice. 10:00 P.M. came very early,. We are getting more friends every day even though they all say we are wasting our time... they are surely solidly tied to Catholicism. Aita e ravea , yet. Nothing very worthwhile today to write about. This has been one of the few days I have taken off for my own diversion. I read the Reader's Digest practically all day except for Gospel class, talking with Gauta on his repentance and taking a walk to see the sick daughter of the ruau . We sat at tua for a couple of hours at night. We were going for a walk to see another ancient spot this morning but it was too stormy. So, we stayed in the house all day doing odds and ends and reading. In the evening we visited te ruau and the sick girl again; she is practically well. Left her a little reading material and visited for awhile. After an hour we came home and went to bed quite early... 8:30 P.M. about. Have been in my Book of Mormon most of the time, visiting with the constant visitors we have drop in now and then, and answering Noromana's questions. During the evening a few fellows brought over a guitar and we sat outside in the bright moonlight and white sand listening. Surely nice. Only Kauko will sing but he's worth listening to. Gauta and I talked for a while alone. He is soon to repent, I think. Elder P. sat inside with Ioane and Marama all evening. In again all day today except for a visit to two homes which I took alone and Elder Price was too tired to put on a tie and accompany me. Gosh! It's a good thing I have a check on my temper or that guy would get a good "telling" every few minutes. Oh! He's dumb! Visited with Teiho ma in their house for an hour or so. In the evening the taurearea came over and we had another good himeneraa . The last of a long month. This last month has really gone by pretty slow but I don't know just where. It seems as though I really haven't accomplished much yet here but hope to in the near future. Tuomea (Prot.) gave me a "Tihoni Viriamu " today. I'm glad to get it due to the fact I have been to the Leeward Islands. He also sent over some sugar cane and pape haari ; our basket is full as usual. Tonight we visited Tekehu ma . Surely do enjoy spending an evening with that family. Surely sorry to hear she is leaving soon for Kaukura. She's a pal! A very beautiful night tonight; full moon, white sand, and even the blue of this lagoon shows up at night. Every place seems to be just so much prettier than the last. A very good way to start off the new month. This evening after dark the Gisborne came. The Chinamen came ashore in the boat, bringing us a package from H.Q. In said package were three letters from home, one from Ena, one from Elder Stevens (Pres.) and one from Elder Miller. Also there was a new Liahona, a stack of Deseret Newspapers and some wrapping paper, plus my mirror, etc. It was as usual, a very pleasant surprise. Pres. Has given us instructions to go to Marokau in Sept. for October Conf., returning back here after it's over. Usual news from home was welcome. During the day we walked to the old water hole and saw an interesting formation and heard the story that always goes with a strange sight. Teiho and were our companions. Spent the morning in writing to folks, Barbara and Pres. We made a sudden change in our plans since receiving President's letter and so now we are leaving for another city tomorrow. Most of today was spent in reading, writing and talking. 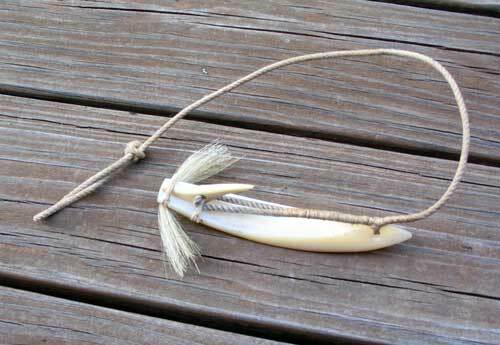 In the evening Tuomeo's wife stepped on a fish hook, driving it into her toe. Tekehu rushed over here and got us to go administer first aid to her. Five minutes later she was back in our house waiting for meeting to start. I really have never seen a girl in quite a condition as she. Teiho pulled the hook out just before we got there. As soon as that happened the girl started to shake. Native form, the people around all jumped on her to hold her down. The leg was cold and she just couldn't control herself at all. I washed the cut with warm water to keep it bleeding, then a little alcohol for a "twang", and then bandaged it. As soon as she felt the warm water she seemed to cool down. Then meeting started. We had regular prayer, songs, and then I talked on Missionary service in our Church as my topic. I guess that's the longest I ever talked in Tahitian in my life. It was successful though. Today I talked with Vahua about Mariama and received her consent to have Marama baptized. Surely glad she could see her way open to consent. We sang after meeting and then retired. Bobby's Birthday. Now to wrack my feeble brain and bring this book up to date from way back to our departure from here e tae noa mai i teie tainie nei . First... the reason we are back: Tomorrow is the big arearea , and as everyone will be coming here from the various cities for the fun, there was no use of our staying away so we returned too. July 3 we left here for little Temarie, a little city about eight miles away or less. Gauta, Vahua and Marama rowed us there on their kau . We took with us food enough to last a week, with the understood agreement Gauta would come over to see us again and see what we needed. We arrived there just as dusk was settling down... the first sound we heard was the Catholic Church bell ringing... of course we commented on what a pleasant sound that was to our ears. July 4 we spent in getting acquainted with our new surroundings. Gauta ma returned, leaving us well situated, mosquito net and all, in their house. A very pretty place... Temarie. Our home was next door to a large cement structure... the C. Church House, and a very nice looking one too. We walked around the remains of what was once a very large city. Our old Church foundation is still there along with numerous others foundations only. Of course our guides were very pleased to show us their place. At night we had about eleven people in to talk over the parau-api . Wed. July 5th We must have made a good impression yesterday because today we were given a coal-oil cook stove, a tea kettle, a victorola (phonograph), and given cooked fish and plenty of pape haaris . They certainly are grand to us. Thur. July 6th Spent about three hours in visiting at the homes. We delivered a few tracts. Everyone accepted but the Katikita... an office just under a Priest. More kindness was shown us in form of avaro , eggs, pape , sugar, fish, etc. Of course we do our best to show our appreciation. Visited Bebe and Nati in the evening. He gave us a pupu and a string of shells. Fri. July 7th I got tired of the house so I took a walk down the beach with my book to read. Got a good four hours rest away from the house. In the evening we had a gang of young folks over for some singing and a little Gospel. Sat. July 8th Today was one of those rare occasions where I put on a swim suit and go i tua . We went after sharks today but didn't even see one. We did obtain our Sunday supply of fish however... more sport corraling them and spearing. In the afternoon I watched the "patia fa " for the first real demonstration. I tried it a few times and much to everyone's surprise, I struck once. Wow! What a surprise. The natives, though, hit very often. We retired quite early. July 9th Sunday. People dropped in quite often to say hello! To us today... in fact practically all day. In the evening I took them over the Trail of the Church from the beginning up to date in a good cottage mtg. Mon. July 10th Elder P. is so busy studying he isn't even sociable at all, so I spend most of my time with natives. He's surely queer. Since I chastened him about "growing up", he has acted a little more like a Missionary but wow! It takes all the patience I have to live with the guy. His questions are recorded! Tues. July 11th Our food supply for the week ran completely out today. I had to borrow flour from Kaua to make farai panis . Miti is high so we can't get fish. We split our last can of deviled meat today... that and nothing else until evening, and then dear Nati sent over some chicken, gravy and rice. Of all the sweethearts! That young couple are swell. Wed. July 12th. Not a thing in the house this morning but flour so I stirred up some ipos . The fire refused to burn and we were very hungry. Just as I was about to throw the ipos out, Vahua and Marama came, bringing with them three loaves of bread, the first real bread we had seen for quite sometime. We sat down to a loaf of bread and our customary pape haari and surely devoured it. That was all we ate for dinner, but at night Bebe brought in the can of salmon I had ordered from the city. A nice get together at night. July 13th and here I am up to date again. We left Temarie this morning amid the waves of practically everyone of the city. Gee, we surely think a lot of those people. Nati said, "Ia reva orua, e moemoe matou ia orua. " Her mother seemed as though she was losing her best friend; she surely brightened up when I told her we would be back. I left Nati a B. of M.
We came over on Bebe's new vaa with Taiura as driver. I handled the little sail on front and he the big one and the rudder. We surely traveled! I never knew a vaa could move so fast. Wow! What sport that was! The wind was heavy and the lagoon a little rough but that is what made it interesting. We engaged in a race about a mile from town and surely beat the other vaa . I'm surely pulling for our vaa (Temarie) to win the big run tomorrow! Home again and a usual hearty welcome. Basket full of pape , friends, and good old Gauta. Teiho cut my hair in my hour's visit with them this afternoon. No one here to night though... Mea maere. Wrote more on my letters. The Ruahatu came in today on her search for pufa , which helped add to the day of sport. She was from other Islands and not out from Papeete so no mail on her. She was here all day. The day started off by the raising of the flag. We all were there, Elder Price and I in "whites" for the first time on this Island. And imagine! The Priest shook hands with us, (after I walked up face to face with him... he couldn't do much else.) Following that, there was a series of soccer games and spear throwing. The boat race wasn't held as there is no wind today. Teheahu left on ship today. We were all very sorry to see her leave.. she is very nice. In the evening I sported the young folks by showing them pictures, etc. We retired around ten P.M. 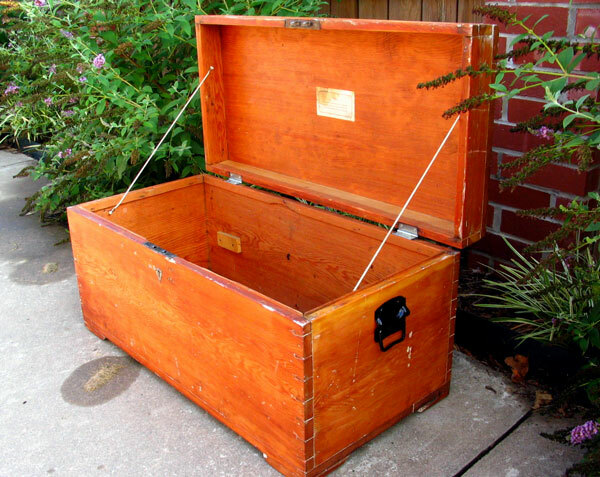 This is the box 70 years later. A block of wood that held the shelf is visible inside. I spent most of the day watching the final results of patia fa . Temarie won which was as we hoped. During the morning I was plenty engrossed in my box. Put in a new shelf, repacked the thing, and have finally got it as I want it. In the evening after dark, we went "Rama" with Teiho. Had fairly good luck and lots of sport cracking the fish with knives. Two very big ones made it well worth while... food for tomorrow. A big day for the Catholics as tomorrow the other city people return home. They have spent all day in huddles with each other. Furthermore no one came at night except Tuomeo and family and Gauta. During the day E. Price and I walked to visit the old lady and Bebeni, and then i tua . The championship soccer game was played this afternoon with Tuuhora winning 2–3. We decided today to leave for Tipipi with the others tomorrow, conditions permitting. Hina gave us a pretty hei of pikuku shells tonight. Nice of her. In Tipipi now. We left Tuuhora about noon and three hours on the sail boat put us across the lagoon. It is a pretty place, grass growing all around, people... now that we are away from the influence of the Priest... are very friendly. Even the "sister" I tried to put in her place one day while tracting was here last night. During the day, I taught the tau rearea baseball... throwing, catching, batting, etc. and then in the cool part of the evening we began a game of work-up. Our home here is with a brother or relative of Gauta's. Gauta came over with us to see for sure that we were taken in. We haven't a bed... sleep on the floor... no pillow, just a blanket, peue , and mosquito net. Our food bill will run up probably these few weeks because of there being only one store, and he's way up in price. Anyway, after a bath, three hours visiting, we retired to our hard bed, but thankful we even have that to sleep on. After all we are among strangers. They don't know us nor we them. Spent most of today talking with Gauta and drawing up plans for the next month. He is returning tomorrow and so we planned when he should be back to take us to Putuahara. For my morning walk I went all the way i tua to see the ocean again; there is something fascinating about it. Read about 40 pages of Tihoni Viriamu today for Tahitian study. Elder Price is a little homesick, I guess... he doesn't talk much. When he does it's something like this: (this came out today) "Oh! So this is a pineapple tree!" (A big tree growing a small bulb with eyes like a pineapple... really no resemblance.) Another: "What kind of coconut should one eat to become regular?" I just have to humor him. "Aue te ati e, ia riro oia ei orometua paari ! " Began tracting this morning without much luck due to the people having gone to work. We decided afternoon and evening tracting would be better so we saw Gauta off and returned to the house. I almost finished Tihoni Viriamu today. In the afternoon we visited for a little while. Evening was spent with Kauko and a couple of other natives and a Guitar. We are going to have to do something to get people to come to the house I guess. My usual morning walk took me down the beach again, this time to discover the ooa just west (or north, I mean) of the house, cuts clear through to the main ocean. Upon returning, we had prayer, breakfast and then sorta planned the rest of the day. We went visiting in the evening.. two homes. Then after returning back here we entertained our company for about three hours. Te oomo noa nei o Noromana i to'na ahu toroa ta'na i oomo na mua to maua taeraa'tu i Temarie. I should think as a Miss. he would tamata i tam'a ia'naiho. Ua fui vau ia'na. Around again practically all day except when I went with Tehei fishing. I caught two and then left him and returned back to the house. Talked a little Kanitoism with Raure this afternoon and in the evening talked tobacco with Tehei. E. Price took one of his usual "meanders" just at the time for our tracting, and by the time he got back it was too late to go. He must be plenty homesick; spends all his time moping and walking somewhere. With the usual singing gang at night.. Kauko, Daniela, etc. I went to the store this morning for food. Imagine my surprise when the leader of the Catholic prayer meetings wouldn't take cash for the bread. A native has the heart of a native regardless of his religion or beliefs. The lady next door, whom we helped shell coconuts yesterday, was her usual sweet self again today. She brought us over a dish of fresh pork and beans with honest-to-goodness onions in it. Besides that she sent over four pape haari . We haven't been without them now for 37 days and due to Timone bringing us five more tonight we have plenty for tomorrow. Even old Tara put in a hand today.. he gave us three ripe iitas, the first fresh fruit we've had for quite awhile. Today for exercise we tackled tua . We got smeared on the ten yard line before we had really began. The score and result reads: a good scare, my swimming trunks torn, my ohure scratched about four inches long, a quarter deep, fingers cut a little and numbed, and Elder Price cut his hands, his feet and lost his shoes. One shoe was recovered but he had to walk back over the rocks with one foot bare. He took it pretty good. Anyway, that mountain of water that knocked us off the reef taught us not to go out there again until it is really quiet. After we got back in quieter water we enjoyed a good swim. The evening was nice. We sat out in front with a large group of people, they doing the singing. The moon was full (almost), breeze blowing, and believe me it was beautiful. I'll surely miss the evenings spent in the South Seas. Gee, it's great! We received two packages from H.Q. today containing a big supply of newspapers, a few report blanks, and I received a letter from Manava in Hikueru (what a surprise! ), one from Ralefa Elder Richards (Ioane) in Takapoto, one from Teina: Elder Haslem in H.Q. and one from Elder McEntire in Vahitahi and Mapuhi in Takaroa. Not much news except Miss. troubles, and the fact I have to translate Sec. 24 of the D&C by Sept. We spent practically all day in reading the month of May's Deseret News. No meetings as nobody is interested as yet in Mormonism. I had quite a time in deciphering Manava's letter but I was surely glad to hear from her. With new determination this morning we went out tracting. This morning we met the Katihita of this village the first thing. A very pleasant hour was spent at his home. I got in a good Gospel point every once in a while sprinkled with news, etc. After leaving him a couple of tracts we visited another place until time for dinner. After dinner we walked across the moor to the other side, gathered a few shells, and I speared an octopus for our dinner tomorrow... a fairly big one. This evening we had a good house full of people (my prayers were answered again). We talked about everything, sang quite a number of songs from our song book and all in all had a swell, friendly cottage meeting. Broke up at 10:00 P.M.
Began translating my Section of D&C today and surely ran into a job. I could translate it in my own way but to have it good enough for printing, I find a task. Ate a big dish of octopus tenacles for dinner. The old woman next door is certainly swell in doing things for us. Nothing further today but read and talk with Tehei. Another small day used in reading Tahitian Bible, a little more thought on D&C translation, a visit to the woods four times, a short visit with Timoni ma. Same group around at night. Pretty noisy. Record of not being without pape haari since landing in Anaa nei is still holding... three for today. 42 days straight. Best I've ever hit anywhere. Finished about five more verses of translating today, went for an hours tracting, read a serial story, and went with Timona to see an odd rock. It was about a mile away but well worth going to see. When it is struck with a rock it rings as though it were a bell. No matter where it is struck it has a different tone. Natives claim that an hour after the rock is struck the ground surrounding is filled with water. They should know by the looks of all the marks on the rock where it has been struck. Our tracting today took us to two more homes; were received very nicely as usual. 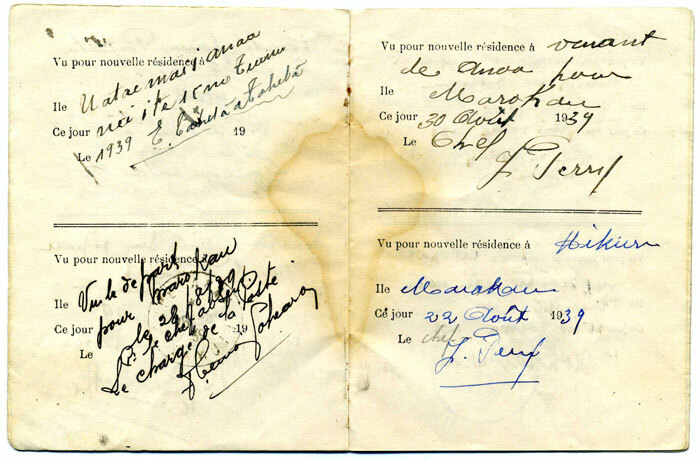 Three more pape haaris kept record intact. Talked all evening with Teihei. There surely must be something in what they claim. The water came in last evening and is still in; two or three natives asked us if we struck the "bell" rock. Nothing much again today. We have contacted practically everyone on this section. Are waiting now, trans(lating) D&C and reading, for next week and then we'll go to Putuahara. Price (1¢) is still in a trance. I surely get a laugh out of his actions. I go in the house... he goes out; I go out, he runs back in; I go out to the woods, he waits 'till I come back. He's just a baby still with a man's work ahead of him. P.S. He changed his garments today for the first time since before we went to Temarie! Began B. of M. again. The days certainly travel even though we don't seem to accomplish very much. I continued in my B. of M. (Tahitian) and read 25 more pages. I hope to have it read through again by the new year. This time I am understanding as I read. Certainly had a swell bunch of conversations with Tehei tonight; practically everything but Child Baptism. He's quite a smart duck but lost on the fact that God and Christ have a body. We took another walk today to see if we could find someone to talk to but today they all seemed busy. A big day Monday with all the taurearea from other cities coming over. Sunday or not it seems to be the usual thing: The people didn't even come around tonight nor during the day only to say, "hello!" and go again. A few outsiders dropped in too. I spent most of the afternoon down i tua . I don't believe it but I honestly saw bigger waves that we saw in Huahine. I was standing way back up on some high rocks, and the waves from tua sent water across the stretch between the reef and shore... about 50 yards... and as they hit the rocks on shore it surely sent a spray in the air, giving me a good soaking once and making me run backwards other times. I just had to stand talking to myself, watching those things happen. After about two or three hours I returned and joined Teihei and (Price) in talking. The end of the month. The taurearea had their big contest of "patia fa " today with Temarie winning honors again. E. Price and I watched the contest for awhile (at one time they had 56 spears in one nut), and then decided to go back to Tuuhora and wait for a boat to Putuahara. After we were packed and awaiting the end of the game so we could go, a letter arrived from Gauta, along with two loaves of bread, stating he would be here in the morning with a vaa to take us over. He is always there when we want him most. So, we unpacked and prepared to stay for the night. In the evening I talked more religion with Tehie while the young folks were in the fare hau celebrating the days victory with hula dance, guitar, song and a lot of yelling. He certainly confessed he isn't very satisfied with the Catholic Church but he says there's nothing he can do about it. He can't quit his tobacco, coffee, etc. so he says. Timoni applied for baptism but I couldn't accept him. During the morning we waited patiently for Gauta to come; packed our things together again. I dropped over to Melani's for a few minutes to say "Goodbye" to her and to thank her for all she has done for us. That floor would have been pretty hard if she hadn't brought us a couple of pillows to lay our heads on. She came back with "no thanks needed" and to prove she is still a pal, gave me two nice porcho (shells), two small pupu , and two herere opaas , and a few pearl shells (parau ). Soon after I arrived back to the house, Petero brought over a basketful of pape haari = 48 days. Gauta came meanwhile, bringing a rented vaa (or the vaa brought him), a box of food and a few clothes for us. We all left soon after for Putuahara, after saying "Ia ora " to Otepipi (just found out how to spell that name). Our vaa ride was slow but all right. We arrived in P. just at dusk, entered our home for the next few days, ate a supper of beef and bread... on the floor... spread out the peue , had prayer, and went to sleep. Gauta went fishing, we went for a few visits. The people here seem fairly decent although not a one has been to see us as yet. There are but a very few families here, about five in all, so we won't be here long. Sat, matou e reva'i . We are certainly camping here. Nary a chair, table, bed. We eat on the floor, sleep there, sit there, and all in all are on our own. G. and I spent the evening, as usual, in talking between ourselves. (Wow! The mosquitos are thick. No rest for the wicked. Five papes for today. A day just equaling yesterday. Gauta went fishing, we went visiting. Met one nice household of people, talked for awhile, left tracts and departed. Vahua sent us a loaf of bread today; she never forgets. Evening we had a nice gathering of young folks (all older, however than us). It turned out to be a fairly nice cottage meeting and they all promised to come back tomorrow night. Of course Ani, the assistant Katikita wasn't here, but we can do without his influence. Surely laugh at the stories about the Priest being mad at us. He has been "bawling out" his people because they bring us the mahiga of the fish and him the homua . I guess we are surely having it better than Elder McEntire. Maybe my using the sample of what he is getting as a Gospel conversation has helped soften these people a little. They're different than they were at first. In our two hours tracting today we made some very valuable (?) contacts. We met the Katikita and talked with him for forty-five minutes... he even accepted our tract when we left. Another family gave us a hei , a pape haari and the girl promised me a new hat when we visit here again. We're finished here now and plan on leaving for Tuuhora on the vaa in the morning. G. didn't go fishing but made some "kilo faraoa ipos ". This evening I got out the "Picture Story of Mormonism" and showed it to a group of eight. We held a nice two-hour cottage meeting in discussing the pictures. I climbed a tree for the first time today in almost two years. It was an uru tree and a big one at that. The reason was to get some food for us for tomorrow. I picked a sackfull in ten minutes and dropped them down to Noromana. After preparing a little, we said "good bye" to "to Putuahara" and sailed away on "to Hernau" vaa . A good stiff wind was blowing so our journey was just one hour long regardless of the front guide sail breaking loose twice and almost upsetting us. It was a wild ride and had its thrills. We arrived safely however in Tuuhora. The news we received today was the death of a 22 yr. old fellow in Tuuhora nei . T.B. has claimed another victim. We dressed up and attended his funeral this afternoon. The Priest led the procession of about 225 people. It seemed to be all in a set form and seemed very queer to me. It was sorrowful though; the mother, sisters and relatives carried on something pretty loud. We went through the customary casting water on the casket while it rested in the hole. I don't know what all the Catholics will say abut our being there, but according to Gauta, they will be pleased. I had a good talk with G., Vahua and Marama today and tomorrow ona e pabetizohia'i . We are alone so far tonight with just Tuomea's household and M. After while I shall bathe and call it a day to sleep on the bed for the first time in about 22 days (or nights). Ohipa toe ra ta'u. Papai. Today amid the stares, gasps, exclamations of everyone that was around, I led Marama down into this beautiful lagoon in Anaa nei and baptized him. I can't describe just how I felt; it seemed so unreal, strange that so many were looking on, and us walking out into deep water. When he came up out of the water though I felt very elated. We returned, he under my arm, to shore, caring not if the whole world was looking on. Gauta and Vahua both had tears in their eyes, and Noromana said, "That was beautiful." He then told me Vahua had been crying. We changed clothes and then I confirmed him a member of the only true Church in the world today. He immediately arose, kissed his father and mother and shook hands with us. It was a beautiful spirit that surrounded us all. So the tamaaraa was on Elder P. and me. We went to the store, bought two cans of beans, two of beef, a loaf of bread and two cans of pears and served it in our house, and having as our guests Gauta, Vahua, and Marama. That takes care of the big things of the day. The rest of the day I wrote to Pres., fixed my orders, time-sheets, etc. and wrote to Teina. This evening we visited Bebeni ma and Teiho ma . Had a little more insight given to us on what the Priest thinks of us. I'd like to "clip" him a good one! Gauta and Vahua left today for Topikite leaving Marama here with us to take care of. While I wrote a letter to Re McEntire and Ralefa Richards, he was busy writing and N. was reading. He went to school in the afternoon and we continued work. I finished my Doctrine & Covenants Section, read a little of Joseph Smith's Teachings and a little of Essentials of Church History. That about constitutes the day except for the soup of beef, uru and rice I cooked outside. The cook-shack is so full of fleas one can't enter the door. Honestly it's terrible around here for fleas. Say! Are we the loved ones around here! One would think we had murdered Marama rather than save him in the Kingdom of God. Anyway we carry the name of "Devil" now, or I do. I walked down the street to Maniga's house to give him a little Permanganate de Potasse for his foot. What a cold reception I received on the street. Even the priest started out of his house but when he saw me coming, he remembered he had forgotten something. As soon as I passed I turned around and sure enough he was coming out again. Really, if it wasn't so pitiful it would be funny. Anyway I had a good visit with the Kanito family and returned home. Asked Elder P. to cook some rice for dinner. He started a few times and then gave up and asked me to do it. So, I gave him instructions how to do it. In the end I got dinner again. We are getting lonesome again at nite. Nobody comes around anymore. The biggest part of the population is in Temarie though so maybe that accounts for it. I bet when we get a bundle from Tahiti we'll be friendly to a few anyway. Teiho is sticking by anyway. Te huru te huru i teie manana. Aore hoe mea i ravehia maori râ i te taio buka e taora popa. The younger folks are getting back to a little more friendly terms now; there has been quite a number around all day for a change. A few taurearea came back so we may have a visitor or two once in awhile. M. said his food prayer tonight for the first time. I think he is a good kid all right. Oh yes. I washed three pairs of garments today in hole water that I had to chip in pieces, it was so hard, to make it run. After they were dry, I sewed up all the holes. We are expecting a ship from Tahiti any day now. In fact I took a round-about walk i tua today to see if anything was in sight. Returning, I commenced again in writing in little diary, reading, etc. We entertained some young folks at night. Tonight M. is sitting right here beside me holding the coal oil lamp while I write. The wind is whistling outside, rain pelting down and the lagoon in an uproar. Elder P. and I just came in fram taking a real shower bath outside in the rain. It is only 6:30 but one would think it mid-night it is so dark outside. We are in our pyjamas all ready for bed. The rain seeped in under the door and the floor is all wet. Quite a night, just the kind I enjoy and can sleep well. Today I visited the Kanitos i tua , took him a little more potasse and spent almost two hours there. Also left them a Monoraa . Talked a little Gospel also. Bebeni gave me three duck eggs and five hen eggs. Was glad to get them as our diet of protein has been slacking lately. "Rheumatism" again in my arm doesn't feel so good tonight. (I'll have to quit amusing the taurearea by throwing a ball at them. Still dream about D.) Tch-Tch. I surely must have here roa ia'na ra . Not long after I remarked to Elder P., "It has rained now; the ship will be in anytime", the "Gisborne" was sighted off tua . We walked down to see what news. We received a small package and met an Englishman. He was alone so we assumed it our duty to show him around. We brought him home, showed him the beautiful view we have out our back window. He was so pleased he took two pictures... large ones. Our talking consisted of this and that and Gospel. All he knew of our Church was the polygamy question... will we ever out live it? Our mail consisted of a bottle of alcohol for P., pictures for P., two ve'as , a note from Uela which tells of Iosepha Petarona's and Viriamu's sickness and a little faaitito on ve'as . Shucks! I found out for absolute sureness why these people won't buy the ve'a . One fellow whose family we took a picture of came after his picture tonight. He was willing to pay for it and when he asked how much, I told him if he would take the ve'a he could have the picture. He immediately came out with, "The Priest has absolutely prohibited our buying your ve'a ." I got in a good point or two on that and then told him just because of the goodness of the "Mormons", he could have the picture. I have a good angle now to fight back at them now when they continue to hound me for pictures. Anyway, the ship left again. We made good friends with the Englishman, I think. He surely shook hands when we parted. Very unexpectedly "Vahine Tahiti" came in this morning going to Tahiti. Upon learning she was leaving immediately, we made a mad rush to finish up all reports, letters, etc., and get them on her. 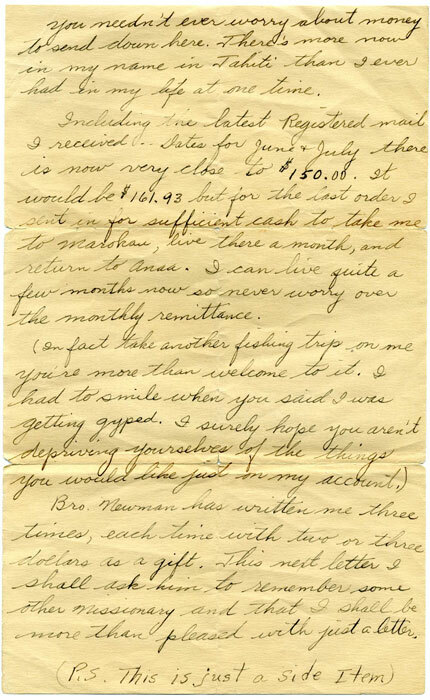 I hurriedly wrote to Pres., Uela, and had already written to Elder Richards, and Elder Haslem, and dashed off a sheet to Mother, just as a "holder offer". Aita e ravea . Couldn't find a minute to write to Barbara... business before pleasure. Tuomea dropped in this morning and before he left, I sold him a ve'a , the first one we have received cash from. We visited i tua again and spent an enjoyable two hours there. The Priest, we learn, has forbidden his people to come to our house anymore. Surely weak-kneed bunch; I'm a little disgusted with them. G. was returning back to Tepikite today so we went along. Just like going to a farm... the dog had given birth to 7 pups, the old hen had 13 young ones, our hen was sitting, the iitas had fruit, etc. Quite the day. We returned in time to meet Tehei and the rest of "To Tepipi". Spent all evening talking with Tehei, G, Herings, etc. Surely a big day for the Catholics. Today is believed to be the day Maria was taken into Heaven. Anyway, just about everyone from the other four cities were here, about 20 pigs roasted and about that many sacks of flour used in making bread. We attended the morning meeting but couldn't get inside... there were about 125 people outside and the house was full. When the plate was passed we obliged by dropping in a couple of francs, which brought a bow from the plate carrier. Then at noon we were surprised when the "food-distributor" sent us a big hind quarter of pork, all roasted ready to eat, and six loaves of bread for our portion. It surely pays to be friendly. Needless to say we surely enjoyed our barbeque. During the afternoon we entertained girls after girls, attired in Sunday frocks, who were seeking pictures. Enjoyed their company but didn't take any pictures. Hiriga and I discussed very earnestly a few points of Gospel. He is as near an investigator as there is on the Island. Evening we visited Teura ma i tua again and then went to the Church-house again and listened to the singing. Long before it was over we returned to the house to sleep. It was supposed that Tematahua's boat would be leaving today and we planned to go on it. In the morning I got things ready to roll up in my peue and then waited for the apoorua to break up so that I could meet "Vaia" and get his permission to make the trip on his boat. In the afternoon we went to visit him. We thanked him heartily for the pork he caused to be sent to us yesterday, then asked his permission which was readily given, and then sat and talked awhile. Our visit was nice regardless of the fact he is a staunch Cath. and we were right next to the Priest's home. When we left he thanked us for visiting. The boat, by the way, wasn't going to leave until tomorrow because of the calmness; naru i breath of wind. A couple of hours later a letter arrived from Vaia which stated, "It wouldn't be possible for him to take us there unless in case of some disaster." Well, we can draw our own conclusions as to who is at the bottom of it all. Regardless of that, tomorrow, weather permitting, we are going to Tematahoa. We'll see if the Priest can stop us. This evening about 25 people came to sing, etc. It was a dead bunch; I did what I could to liven them up... even played the guitar while Elder P. and I sang! They all came to hear him play the fiddle but he only played one selection and refused anymore... what a guy! Good crowd anyway. We had decided to go to Tematahoa by land today but due to the heavy wind and rain the boat couldn't leave. Therefore, there being no people there, we stayed here. Quite the talk now that we prayed for the wind and rain just to spite those who wouldn't let us go on the boat. Everything bad turns up, we get the blame in some way or another. Quite the people. Nothing today except taking medicine to the fellow i tua . He was glad to get it but said our book on the "Monoraa" lied. They won't believe anything. "Moana" came in this morning, two days ahead of schedual. There was a Patrick Ryan aboard who spoke nothing but English so I entertained him while they were here. We had a nice long chat and parted good friends. For my lot in study line I read Tah. B of M., Bible, and talking. ...Hiriga has surely become interested in the Bible. I took the case of J.B. some ginger today to warm her up. She hasn't but a very few days left and again may linger on for a year. The old man's foot is much better now. He was outside today. Told E. Price about the little Red Hen. "To Tematahoa" left today so that means we will leave Monday. Haven't done much today but talk with "Lucy", "Ana", and Hiriga besides reading without learning anything. Wore a blister on my fingers whittleing at a right-side wooden diving glass. Hiriga got a fish for a change today so we didn't have to wield a can opener. Oh yes! I finished my translating and it is now ready to send to H.Q. Last night I talked with Tuomea about his boy. He said he would consider my request and let me know later. A few taure'are'a tonight but nothing of interest. Gauta returned today keeping us in pape haaris for another day. One day only have we been without and that day I drank ah opaa . This morning just before daylight I was awakened by the dropping of a coin. Without making a sound I turned over to see what was going on. Not a soul in the house, but as I lay quiet, waiting, the door slowly opened and M. came in quietly, carrying Elder Price's pants. He put them on the floor and then went back to his bed on the box. I lay for awhile, pondering over his actions, wonder just what he was up to. Then he arose again, picked up P.'s pants and went to the open doorway. There he fumbled through the pockets awhile and then returned the pants again. He then returned and searched around on the floor for the coin he had dropped. I lay quiet, wondering whether to call him then or wait awhile. He returned to his bed again and lay down. A few minutes later the sky began getting light so I got up. He peeked out from under his blanket and then pretended sleep. I arose, dressed, and went out then returned and began to read. At 6:00 A.M. Elder P. got up. I asked him to count his change just to see if any was missing. He said there wasn't so I related the morning's happenings. M., meanwhile, was still supposedly asleep. We decided to wait until he got up and then talk with him. As we waited, he drowsily got up, threw off his blanket, staggered to the door and was on his way out when I called him back in. He didn't want to come, but he "drowsily" did. I began questioning him but he lied like a born trooper but as soon as he saw I knew, he shut up. I chastened him quietly for awhile, cited a little passage or two to him and then told him to try to do better. He had taken money, but the second time he took the pants he had returned it. I surely hope he will do better in the future; he has pulled a little shady stuff every once in a while lately. Wrote two letters to Pres. today: one in tahitian and one weekly letter, also filled out reports. Spent most of the afternoon in reading B.Y. and Bible and in the eveining went to Teheura's home and we had a nice cottage meeting. Rauri was quite the life there. Surely wish I knew my Bible like the old lady--wow! 9:00 P.M. returned home and retired for the night. It is really Aug. 24 today and we just got in an hour ago from our trip to Tematahoa and back. I really can't do justice in describing all that took place but I'll try. We left here about 7 A.M. Monday with Teuira as our guide. He was carrying his spear and niau basket full of his things... pillow, blanket, lamp, and clothes, and I was carrying our peue with two blankets, tracts, and our odds and ends in, and Elder P. was carrying two loaves of bread. We went by land, following the ocean line sometimes and the lagoon other times. This island has a white-man's name of "Chain Island" and how well I found out the derivation. Elder P. had to be carried over each break due to the fact he only has one pair of shoes and when they are gone he has to send to Tahiti for his other. I believe there were a dozen places before we were through that he had to get on my back and be carried a hundred yards, fifty, ten, twenty, etc. Teuira carried the peue most of the time while I was carrying N. Tematahoa is about fiften miles distance from Tuuhora. Every time we were thirsty T. climbed a tree and obtained water. I drank ten the first day. He surely is a "wow" with a spear. I've really never been with a kid that is more accurate. We got plenty of "Kukiro", and one big "paaihere". At dinner time we cooked our fish on rocks, and that and our bread and "komo viavia" constituted a good meal. We arrived in Tem. pretty tired and after dark. Aug. 22 we went visiting and looking the city over. In one of the most populated cities of olden times we found about ten people and that constituted the population. We visited each and every family. Nothing further for this day but looking around. We retired early. Just after I had dropped off to sleep... N. and Teuira were sleeping soundly... I heard a voice telling me to wake up. I did and there were two girls... the one a "Mormon" and her friend that we met in Tuuhora nei . I asked them what they wanted, and they said they had come to sing. It was late and I told them so but they wouldn't take the hint. No reira, ua tomo raua i roto i te fare, parahi ai. E mea maoro a'era ta matou paraparauraa i niaiho i te tahi fenua e i te tahi fenua I muriho ua reva raua are'a râ ua tamata raua ia taparu ia'u ma te parau, Rutena e, a haere mai vei muri. Epiti ta'na piiraa i te reira parau. Aita ra' vau i farii i te fuahemaraa o te diabolo. Ua hoi'au i te taoto. Aug. 23 we went visiting again leaving tracts. One fellow accepted and as soon as we left, he tore them up. I had asked him when his boat was returning to Tuuhora, knowing our work was finished here and hinting for an invitation to ride back. He said, "Monday", but I knew he was lying so I let him lie. About two hours later we saw his boat returning. That's the kind of a person all the Catholics are here... almost. Not all, 'cause some of them are swell... Tehei, Bebe, Melani, etc., etc. At night the two girls came again. We sang for awhile and then they got sent home. Ua tamata faahou raua ia faahema mai. Ua anihia vau ia haere atu e taoto ai i te hoe. Teuira râ, e mea fatatai ona i te putohia e te Momoni hauti. Aita e huru mai ia raua. Aug. 24. And that brings me up to today. We left Tematahoa, and glad of it, for good this morning about six o'clock. An hour or so later Teuira had three big "ume" and so we soon ate breakfast of pape haari , avaro and fish cooked again on rocks. Our noon day meal consisted of mao'as roasted. We arrived here just at dark. No water so we have to go to bed without bathing. Just while I've been writing this, sitting here in my pyjamas, six taurearea have come in. Now, as tired as I am, I won't go to bed for another couple of hours... they're too hard to get rid of. P. won't talk so I guess I'll have to. I've had to say a few sentences every now and then since I have been writing this. I surely glad our trip out there is over and that it won't have to be done again. My white shoes will never be worn again, due to the cutting they took on the rocks and one pair of socks shot. Well, it's over! E hakaviru-haga o te hagahaga this morning and then I took my morning walk. On passing Teiho's house he called me over and presented me with a new hat. Very nice of Moma to remember our trip for Conference and give us a bonnet. Yes, Elder P. got one too. The rest of the day I read Ess. and began a lesson on grammar with P. As usual, he didn't know it so I made the same assignment for the third time. Tonight Teiho brought over some faraipani waffles, cooked with holes and everything. Surely good. A walk to tua and back and it's time to retire. Caught up on a little belated reading today, held grammar class for Elder P. and spent the rest of the day in talking with Gauta, Tuomea, Teiho, e te tahi atu â mau taurearea . Koko tipped his vaa over today. The wind was a little too strong. Surely cold here lately. I've been sitting in every bit of sunshine that could squeeze in the cracks, doors and windows. That wind from the South carries a pretty cold wave with it. Tirara parau no teie nei mahana. I don't care much for Sunday here except it gives me a good chance to read. I read Ess. again for abut 100 pages. Meanwhile ate dinner, talked with Teiho, kids, etc. and then in the evening visited our family i tua and had quite a scriptural discussion with Kauko. Wow! He's surely hot-headed but cools quick. He got pretty mad though we did nothing but preach the truth which is just opposite from their "blind" ui Katorika . If I believed as they do, only sincerely, I'd be in constant "hell" throughout my days on the earth. The picture book of Catholicism was fantastic to say the least. Imagine going "down" for eating too much! Wow! Do things ever happen around here or elsewhere. I can't believe it but it is the 31st of August and Elder McEntire, Braegger, Price and myself are in Marokau. Starting back from Monday: We were awakened early by "Tero". We soon learned that Gisborne was in from above going in to Tahiti. That didn't mean a thing to us except for sending in a few reports. We heard "Gustav" was leaving so we went back to see him off and there was Vahine Tahiti just docking. Well! That was different! On her we received a package with mail from the States... 1 Mother, 1 Bishop, 1 LeMoyne, 1 Eldon, 1 Bro Newman, 1 Verba, and 1 Aunt Marie. Then one from Pres. to top it off. We then returned to the house, divided the spoil and began reading. Just after we finished a knock on the door was heard and in walked our English friend. Our visit with him ended in an afternoon swim. Just as we returned to the house G. met us and gave us another package... Moana had docked. My! How popular this Island turned out to be. In this there were four registered for me and a package of newspapers. Then came the big decision. Gisborne had gone on the rocks and was injured; Moana was leaving for Marokau in an hour. It was either take Moana , get to M. a month before we wanted to, or take a chance (?) on another boat getting out to us. We took Moana and said "Goodbye" to friends and Gustav and left just before dark.